Description: The Stromanthe sanguinea is a wonderful plant to grow either outdoors or indoors as a houseplant. It is a native plant in Brazilian rain-forests. Being a member of the prayer plant family, the leaves fold up as if in prayer. 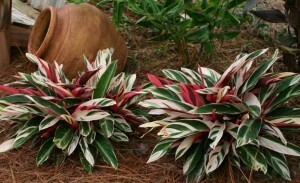 The dark green leaves are variegated in shades of pink, red, white, or green. Indoors, it can grow to a height of 60 to 90cm (2-3 feet), but grown outdoors, this plant can easily reach to 1.5m (5 feet). They produce reddish-pink flowers in spring. Proper Care: Stromanthe sanguinea catches people’s attention with its dazzling foliage, so untidy or damaged leaves are instantly noticeable. Snip off the damaged or tattered leaves at their point of origin using pruning shears, but be careful not to cut or damage the surrounding leaves or stems. Grooming can be performed at any time of year, but it is best to do it in spring before the plant enters its active growth phase. Light: Indoors Stromanthe sanguinea should have medium light. Keep the plant out of direct sunlight, especially during the summer months. During the summer months, this plant can be taken outdoors. Place it in a protected area that offers partial to full shade. In direct sunlight, the leaves will burn. In the fall, when the temperatures drop into the lower 10°C (50°F) , take the plant indoors. Set the potted Stromanthe sanguinea in a north or east-facing window for best results. Temperature: Stromanthe sanguinea need high humidity along with normal room temperatures. They are suitable plants for a terrarium. Watering: Water the soil thoroughly. Feel the soil for moisture by inserting the finger into the soil, 2-3cm (1 inch) deep. If it feels dry, give to Stromanthe sanguinea plant a good drink of water. Mist the foliage daily. This plant thrives on high humidity, so mist it, use a humidifier or place it on trays of moist pebbles to help raise the air moisture levels. Do not allow the pot to stand in the water. Keep Stromanthe sanguinea out of droughts. Fertilising: Use half-strength standard liquid fertiliser once every two weeks from early spring to late autumn. Potting and repotting: A peat -based potting mixture is best. Repot Stromanthe sanguinea only when top growth begins to extend beyond the edge of the containers; it is best done in late spring or summer. Shallow pots or pans are ideal containers for these plants. Propagation: Divide any overcrowded clumps of leaves just as plants begin to make new growth. Carefully detach a section of rhizome bearing two or three leaves from the main rootstock and place it in a 5-8cm (2-3 inch) pot of moistened peat-based potting mixture (with a little sand added). Enclose the whole in a plastic bag and keep it warm in medium light until the new roots will develop. Then remove the new plant from the bag and treat it as mature Stromanthe sanguinea. Uses: Grown mainly for beautiful cream, green, and pink foliage. Great for containers and in landscape. Stromanthe sanguinea is suitable fro bottle gardens. Look out for attack from part of the aphids and the development of fungus diseases often favoured by humid climate.